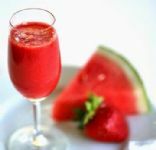 This easy to make Traditional Mexican Drink is a delicious way to use left over summer Watermelon. It is sweet but not too sweet. Cool, refreshing, and great for you!